The Band-It S750 Air Tool is designed for high volume production clamping of all widths of Band-It Jr Smooth ID Pre-Formed Stainless Steel Clamps. The Band-It S750 & Band-It S75099 pneumatic tool is designed for volume production clamping of all widths ofBand-It Jr pre-formed Clamps with diameters from 20mm to 200mm. As stiffer and thinner materials increasingly replace soft, spongy thick-walled rubber , Band-It developed the Smooth ID clamp with a uniform gap-free inside diameter that virtually eliminates leaks.Band-It Smooth ID clamps are manufactured in 44 sizes with widths from 6.4mm to 19.05mm in both 201 & 316 Stainless Steel. The Band-It Smooth ID clamp provides a lower profile to reduce the risk of snags when dragging fire hoses. Band-It Pre-Formed Clamps can be applied with the C001 Tool and either the J001 or J050 Adaptors. 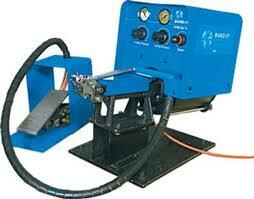 For high speed & large volumes they can also be applied with the S750 Pneumatic Tool.